The Baltimore Colts were cruising at 5-0, and had lost only once in their previous 19 games (that included two ties), as they hosted the Cleveland Browns on October 20, 1968. Head Coach Don Shula’s team was winning despite the loss of star QB Johnny Unitas to a severe elbow injury in the preseason. 34-year-old QB Earl Morrall, acquired from the Giants as insurance, was filling in admirably for the all-time great. The rest of the club was solid. If anything, with the Browns coming into town they could be excused for looking ahead to a showdown with the Rams the next week – the team that had inflicted the defeat at the end of the 1967 that cost the Colts a spot in the postseason. Cleveland, coached by Blanton Collier, had a 2-3 record and was most recently coming off a loss to the Cardinals. They, too, had gained a new quarterback in the prior offseason in Bill Nelsen, who came from the Browns and supplanted veteran Frank Ryan three weeks into the schedule. 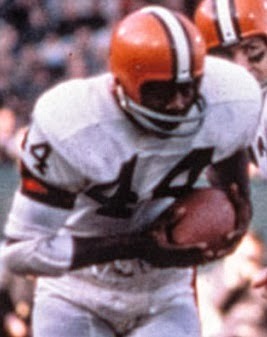 They had an outstanding runner in HB Leroy Kelly (pictured above) and equally great receiver in split end Paul Warfield and, after starting slowly, the offense was beginning to come to life following the change at quarterback. There were 60,238 fans in attendance at Memorial Stadium on a sunny afternoon. The Browns took the opening kickoff and put together a long series that featured Bill Nelsen throwing to WR Eppie Barney for 15 yards and Leroy Kelly gaining 14 yards on a draw play in a third-and-six situation. But after reaching the Baltimore 29, Nelsen was dropped for a 10-yard loss on a third-down play and Don Cockroft’s 47-yard field goal attempt fell short and was returned by FS Rick Volk to the Baltimore 25. The Colts got a quick first down when Earl Morrall threw to WR Jimmy Orr for seven yards and FB Jerry Hill followed up with a four-yard run. However, three plays later Morrall faced a heavy blitz and, hit by DT Jim Kanicki, fumbled. LB Jim Houston recovered for the Browns and they took advantage by driving 37 yards in seven plays. Nelsen threw two passes to Paul Warfield, for 15 and 9 yards apiece, and Kelly took a swing pass to gain the last two yards for a touchdown. With Cockroft’s extra point, the Browns were up by 7-0. HB Preston Pearson returned the ensuing kickoff 35 yards to his own 40 and the Colts were at the Cleveland 49 as the first quarter ended, but had to punt. The Browns, pinned down at their 10, went three-and-out and Baltimore regained possession at midfield. Morrall immediately went to the air and hit Orr for 27 yards and HB Tom Matte then ran the remaining 23 yards for a TD. With the conversion by Lou Michaels, the score was tied. The teams traded punts as neither offense was able to move until, with just under three minutes remaining in the half, the Browns took possession at their 19 and mounted an 81-yard drive in 10 plays. Kelly ran the ball well and gained 16 yards on a pass completion. A throw by Nelsen to TE Milt Morin picked up 20 yards and had another 15 yards tacked on for a roughing-the-passer penalty to get the ball to the Baltimore 19. The drive culminated in Nelsen passing to Warfield for a five-yard touchdown with the clock down to 24 seconds and Cockroft added the PAT. Cleveland went into halftime with a 14-7 lead. When the Colts came out for their first series of the third quarter, Johnny Unitas was at quarterback, much to the excitement of the crowd. It was not a promising return for the veteran star, however, when his first pass was deflected and intercepted by FS Mike Howell. Starting at the Baltimore 34, the Browns methodically drove to another score in eight plays. Nelsen threw to Barney for a two-yard TD, Cockroft booted the extra point, and the visitors were now leading by 21-7. Unitas threw two incomplete passes on the next series, but the Colts got a break when CB Ben Davis fumbled the resulting punt and LB Bob Grant recovered at the Cleveland 37. The rusty Unitas still had difficulty completing passes, but Baltimore managed to get a 17-yard Michaels field goal to make it a 21-10 game. The Colts managed to retain possession on the following kickoff when Michaels recovered his own short, bouncing kick at the Cleveland 29. Baltimore picked up only four yards in three plays and Michaels kicked another field goal, this time from 33 yards. The teams traded punts for the remainder of the period. The fourth quarter started with Unitas throwing for Orr, but the pass bounced out of the receiver’s hands and was intercepted by LB Bob Matheson, who returned it 30 yards to the Baltimore four. From there on the next play, Kelly ran around end for a touchdown. While Cockroft’s extra point attempt was blocked by DE Bubba Smith, Cleveland was now ahead by 27-13. Another short series for the Colts ended in Unitas throwing an interception, this time with DE Bill Glass grabbing the deflected pass and giving the visitors the ball at the Baltimore 17. By this point, many in the crowd that was earlier buoyed by his return were booing the all-time great as he left the field. The Browns reached the four before Cockroft kicked an 11-yard field goal. Morrall was back at quarterback for the Colts, to the cheers of the fans, and he went to the air eight times, completed five, with the last pass to WR Willie Richardson for an eight-yard touchdown. The extra point by Michaels made it a ten-point game, but that was the last gasp for Baltimore. An onside kick was recovered by the Browns and they were able to maintain possession and nail down the 30-20 win. Cleveland had more total yards (305 to 212) and first downs (19 to 13) than the Colts. The Browns especially ran the ball effectively, gaining 179 yards on the ground. The key was Baltimore’s five turnovers, to one suffered by Cleveland. Leroy Kelly was the star on offense with 130 rushing yards on 30 carries that included a touchdown plus 18 more yards on two catches that included another TD. Bill Nelsen (pictured at right) completed 15 of 23 passes for three touchdowns with none intercepted and also ran the ball four times for another 32 yards. Paul Warfield had 5 pass receptions for 46 yards and a score. For the Colts, Earl Morrall was successful on 10 of 18 throws for 130 yards and a TD and one interception. Johnny Unitas completed only one of 11 passes for 12 yards and suffered three interceptions. Tom Matte rushed for 64 yards and a TD on 13 carries and gained another 37 yards on two catches. John Mackey led the receivers with three receptions for 41 yards while Jimmy Orr also caught three passes, for 38 yards. With Morrall continuing to start for the remainder of the season, the Colts regained their footing to decisively defeat the Rams the next week and continue on to a 13-1 record and first place in the Coastal Division. The win over the Colts initiated an eight-game winning streak for the Browns, who topped the Century Division at 10-4. Both teams won their conference title games, with Cleveland upsetting Dallas in the Eastern Conference and Baltimore easily dispatching the Vikings in the Western Conference. In the rematch for the NFL Championship, the Colts gained their revenge by a convincing 34-0 score. However, the dream season ended with a stunning loss to the AFL-Champion New York Jets in the Super Bowl. Leroy Kelly led the NFL in rushing for the second straight year with 1239 yards on 248 carries (5.0 avg.) and 16 touchdowns. Adding in 22 catches for 297 yards and another four TDs, he led the league in yards from scrimmage (1536), touchdowns (20), and scoring (120 points). In addition to receiving consensus first-team All-NFL and Pro Bowl honors, he was named as recipient of the Maxwell Club’s Bert Bell Award as NFL Player of the Year. Earl Morrall was the consensus league MVP, however, as he led the league in passing (93.2 rating), touchdown passes (26), yards per attempt (9.2), and yards per completion (16.0) while placing second in passing yards (2909) and completion percentage (57.4). In sixth place (third by the current rating system, at 86.4) was Bill Nelsen, who ranked in the top five in yards (2366), touchdowns (19), yards per attempt (8.1), and yards per completion (15.6). Johnny Unitas saw scant action during the remainder of the regular season, but did lead the Colts to their only touchdown in the Super Bowl defeat in relief of Morrall. 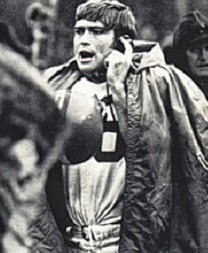 While there were concerns as to his ability to come back (he was 36 by the start of the 1969 season), he did return to the starting job, although with increasingly diminishing returns until his last year in 1973.